I just received my “new” $1300 op-1 in the mail and this is the date and time… is TE selling old stock for the updated screen price?! Rev 2’s may be from gen two or three I hear. which means soon the OP-1 might be out of production again. 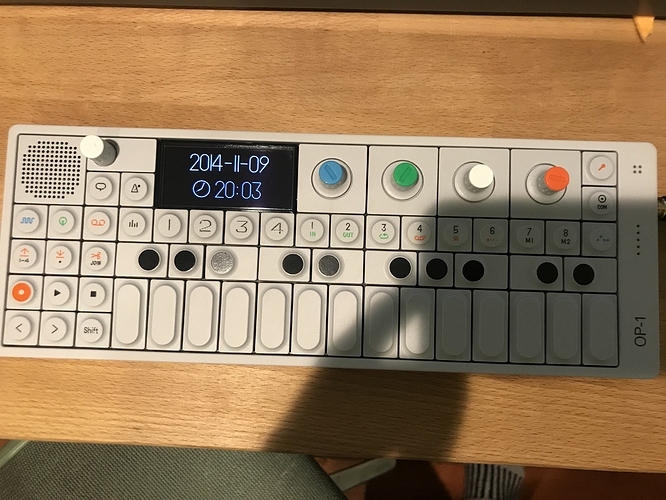 when I saw the pictures of the crumbling packaging of the OP-1s there were sent out recently I thought, they found some old stock somewhere in the garage and started selling that. not wanting to accuse anybody here…those were just my thoughts. Gotcha. Yeah I don’t know if there is any way to see if it’s actually a new one or not. AFAIK the model number has been TE002 since the beginning. Check the serial number (can be found on packaging or behind the braille plate at the bottom under the I/O ports. The internal clock was initially off by some years on my unit (bought 7 years ago), too. So it is not a very reliable indicator. The serial number as it is placed, wont tell you much. They are stickers not engraved . Just a piece of paper stuck on the unit and the box. If TE refurbishes a unit it can ( and does ) simply replace the old serial number. They replaced the screen only, right? They may have the old ICs in stock otherwise. uhh i don’t think the clock is supposed to be set correctly fresh out the box. mine was set in year 2029 when i got it. does that mean mine is from the future? mine defaults to 2013 even though I bought it at launch. I think the dried out crumbling package is what makes me most suspicious. It all just feels and smells like it has been sitting for a few years. The packaging probably(most likely) has.